I wasn’t able to finish at that time, but I took the parts with me to quilt retreat in February and got the whole thing together. I made color decisions as I went, and I really like this kind of design-as-you-go mentality. 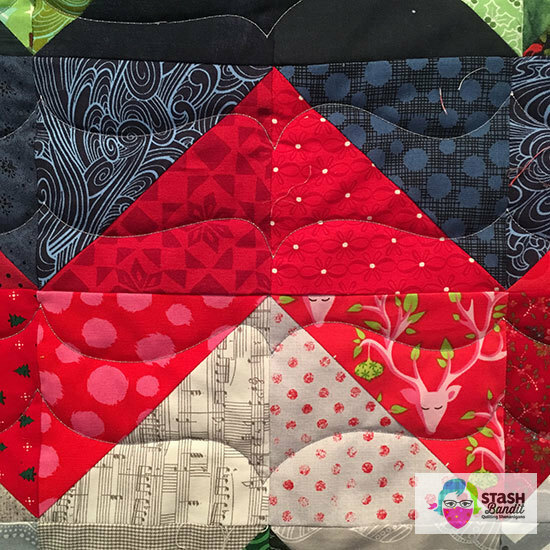 It’s such a simple quilt but it works nicely because of all the different fabrics. 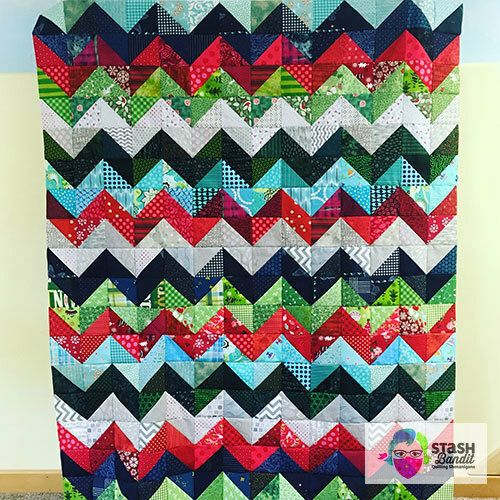 I had an appointment with the longarm at my local quilt shop on March 1 so this was the perfect quilt to practice with. What usually happens is that I show up with no idea of how I’m going to quilt something—which is kind of a problem. Sue Brown is the owner at Calico Cottage in Hastings, Nebraska, and she’s very helpful, but it’s not really her job to figure out how to quilt something. I have finally realized that it’s my job to have a pretty good idea of how I will quilt something before I arrive. This time I was ready. The night before, I pulled out all my books on machine quilting. (It’s probably not insignificant that I realized I had never actually read these books.) 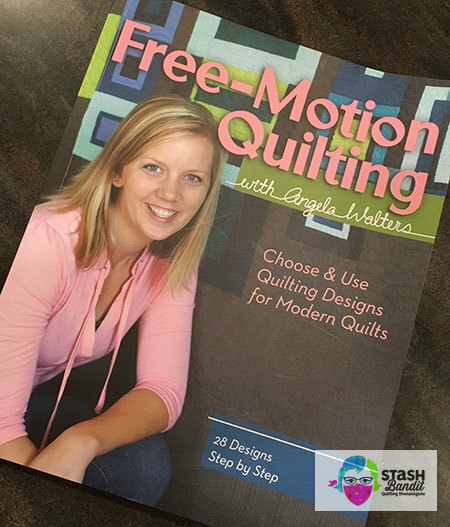 I paged through a couple and landed on page 65 of Free-Motion Quilting with Angela Walters. Somehow I knew this bracket would be perfect for my chevrons. 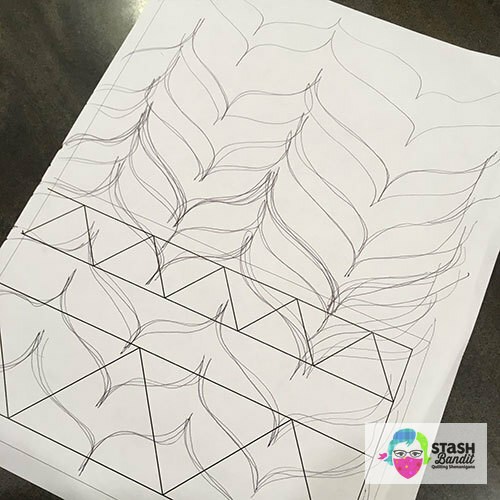 I’ve heard many machine quilting artists say that building muscle memory by drawing the quilting design is important, so with pen and paper, that’s what I did. I did it for the better part of an evening. When the quilt was loaded and we were ready to go, I felt PREPARED. And when I started to quilt, it just FLOWED. I knew exactly what to do, and even though I had never quilted brackets before, I marched across that quilt like a pro. I won’t show up at the longarm again without a plan. I will always practice on paper. You can see that it’s not perfect, but that’s okay. It’s finished, and it’s good enough. 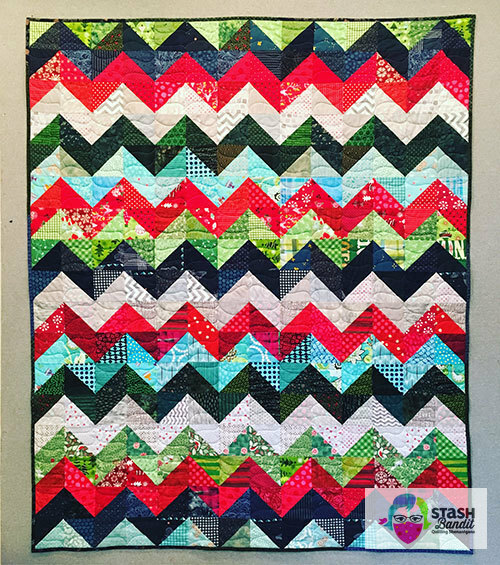 Here are the particulars so you can make your own chevron quilt. 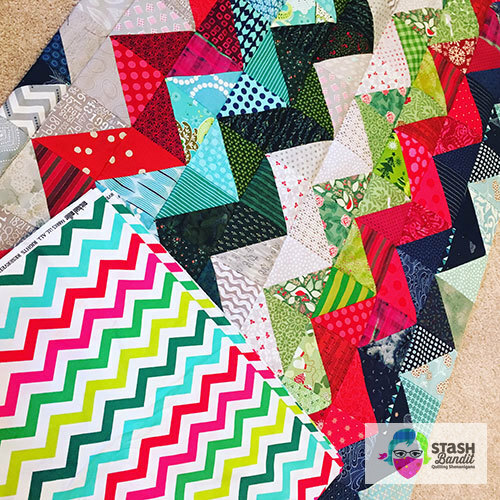 • Start with 5″ squares. 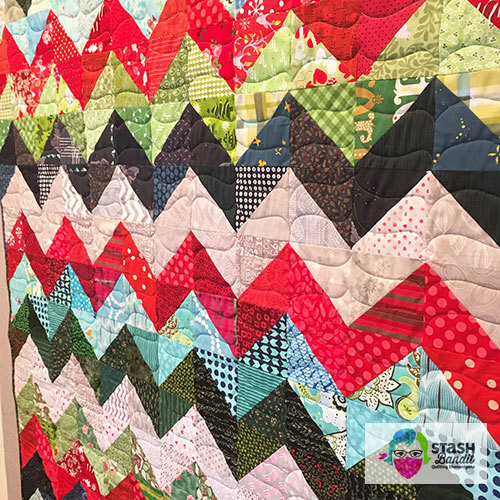 Make them into triangle-squares by sewing 1/4″ out from both sides of a diagonal line marked on the wrong side of one. Cut them apart and press open. No need to trim them down further, because all they have to do is fit with each other. • Begin with two colors and then work your way down the quilt, making color decisions as you go. 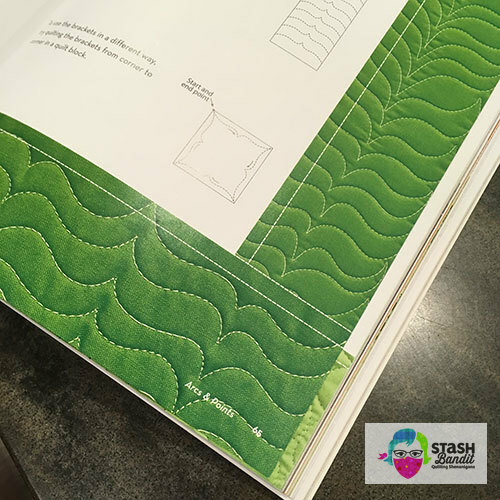 Keep the fabrics within each set of chevrons similar in value (lightness or darkness of the color). Stand back, way back across the room, to audition fabrics. • This quilt is 14 triangle-squares across and 17 down for a finish of about 57″ x 70. Perfect for the couch! 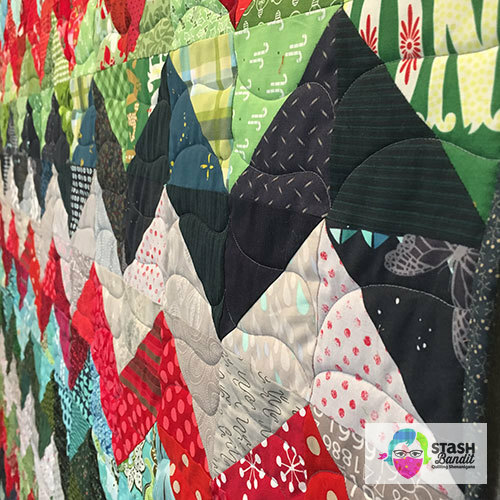 This quilt fits nicely in two of my trunk shows: Make Extraordinary Scrap Quilts and the Jingle Bells Trunk Show. I’d love to bring them to your town. 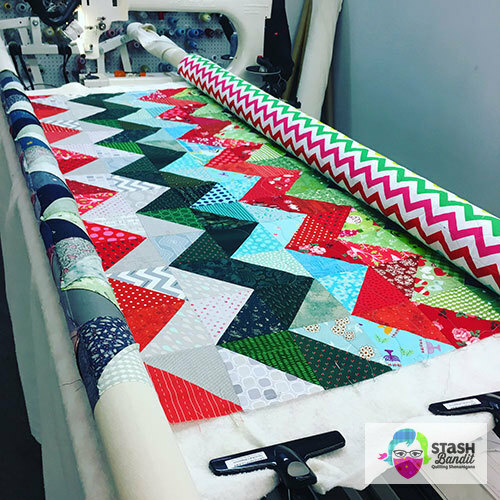 Give me a jingle and Let’s Talk Quilts! I saw this in process – it turned out great. I am impressed and inspired. Great article, Diane. 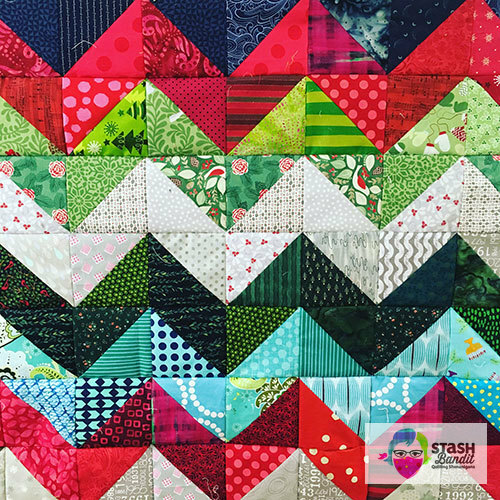 i really want to start doing some of my own quilting, so i’m going to come up with a plan start on something small, soon. Thank you, Kay! I often practice on fat quarters layered up with batting–old ones that I don’t think I’ll ever use. They’re the perfect size. I like the chevron pattern. Never would have thought about using the brackets. Great idea.